The Flash won't be called "The Flash" in Justice League, actor Ezra Miller has revealed in a recent interview. The young superhero is still figuring himself and his powers out and that means no fancy alias to go by when he teams up with Batman, Wonder Woman, Cyborg, and Aquaman. Instead he gets to be plain old Barry Allen. Hard to imagine people screaming "Barry" in the midst of fighting isn’t it? It makes sense that the young hero wouldn’t have his (ahem) flashy title ready to go straight away. Think back to what the speedster says in recent trailers: "It's really cool you guys seem ready to do battle and stuff, but I've never done battle. I've just pushed some people and run away." He’s a total noob. 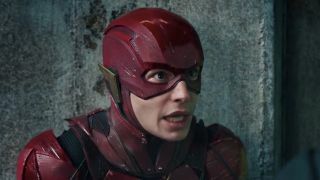 Flash's griping to Batman has already become one of the Justice League movie's best showcases of humor, but it's also a pretty good indication of how inexperienced Barry is as a hero. Miller says that there was a scene filmed in which Barry sat down and figured out his alter-ego's moniker, but that was cut for the final edit. However, Barry is the one who discovers and names the Speed Force, a sort of kinetic energy that gives him his power. Perhaps this deleted scene will show up when Justice League comes to DVD and Blu-ray, or maybe Warner Bros. will save it for Flashpoint, the recently-announced solo film for the fastest man alive. In any case, judging by how much personality Miller brings to the role, it's clear Barry will be a fan favorite by the time the film premieres on November 17, regardless of what he calls himself.